Tajikistan casts dice in hydroelectric gamble, but will the people benefit? Nine years after Tajiks were strong-armed into buying shares in a hydropower plant, it has begun producing power. Will they see dividends? Or will the electricity simply benefit the elite? 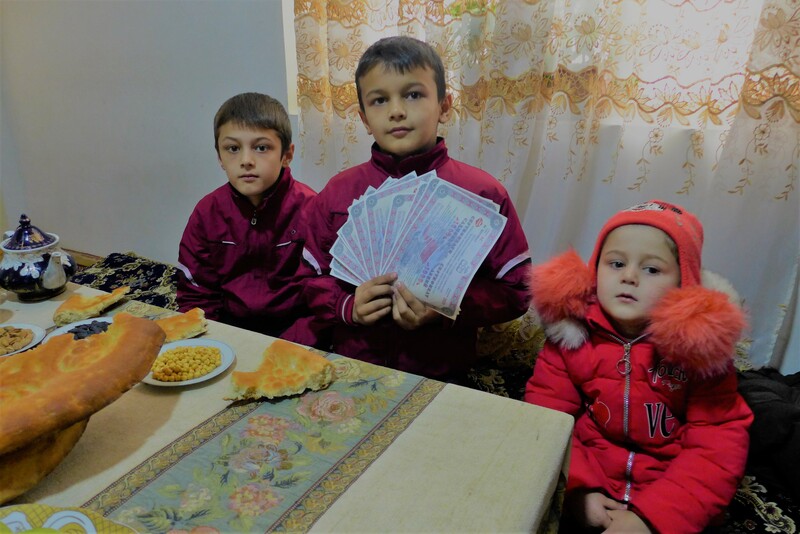 Roghunshoh, a shy and studious nine-year-old in the northern Tajikistan village of Madaniyat, does not quite understand how he came by his name. “I get top marks at school and I want to become a lawyer,” he told Eurasianet, diffidently. His name represents a hope – a gamble, even. The boy was born at the end of 2009, just as the government had resumed in earnest to think about resurrecting a long-dormant project to build the world’s tallest hydroelectric dam. But there was a big problem. Tajikistan was – and remains – disastrously impoverished. So it was that the government issued shares to fund construction of the Roghun dam, which is currently slated to cost around $3.9 billion. Countless people were strong-armed into buying the stock. Some, like Roghunshoh’s grandfather, Abdullo Bobokhonov, who died in 2015, were enthusiastic champions of the initiative. As his widow, 57-year-old Muhabbat Bobokhonova, recalled, the retired state prosecutor was among the first in line to buy shares at a local branch of the Finance Ministry when he heard the news of his grandson’s birth. “He was delighted with the news … and he immediately said that we should call the boy Roghunshoh,” said Bobokhonova. Bobokhonova said relatives and neighbors tried to talk the family out of it, insisting that Roghunshoh was not a nice-sounding name for a child. But after doing some research and determining, through some imaginative etymological detective work, that the root of the word Roghun signified light, they decided to press ahead. “Roghun means light, and shoh means king. Let our child be the king of the light of all Tajikistan,” Bobokhonova said. President Emomali Rahmon officiated over a ceremony marking a major stride in making Roghun a reality on November 16, when the first power-generating turbine out of the six planned for the dam was set into motion. Salini Impregilo, the Milan-based company that was awarded the contract to erect the 335-meter-high dam, said in a statement that the schedule envisions a second turbine producing power by 2019. In his speech at the dam, Rahmon paid tribute to fellow Tajiks who contributed to funding the work. “I urged people to invest in Roghun. To those who made a contribution, I am sincerely grateful. This is a project for future stability of a peaceful and happy Tajikistan. It was thanks to you that we have moved toward energy independence,” he said. In reality, however, many submitted to Rahmon’s exhortations only under pressure of losing their jobs or places at university. For those who believe fervently in Roghun, urging people to pitch in hard-earned cash was an acceptable price to pay. The Bobokhonovs’ home district, Jabbor Rasulov, a spot around 300 kilometers north of Dushanbe that once bore the decidedly communist name of Proletarsk, still bears the scars of the cataclysmic and sudden fall of the Soviet Union. Almost immediately, residents began feeling the chronic shortage of household electricity and gas. For heating, most turned to burning wood in their stoves. In spite the all-consuming stock-selling campaign, a relatively paltry $185 million was raised. That was a lot for a financially struggling population, but a small portion of what was needed. As to when shareholders can expect to receive dividends, nobody is holding their breath. “As of now, nobody has said a word about this,” said Kholmatov. More recently, the government has resorted to bolder measures. In September 2017, Tajikistan placed $500 million worth of international bonds at initial yield of 7.1 percent with the express aim of providing funding for the project. Those figures represent an onerous 10-year repayment schedule that significantly raises the stakes for success at Roghun. For the period from 2025 to 2027 alone, Tajikistan will be on the hook for more than $200 million. Output projections appear to justify this gamble. If the plant is completed as envisioned, it will, at peak capacity, be able to produce up to 17 billion kilowatt hours of electricity. By one estimate, this would be enough to meet the current needs of the capital city, Dushanbe, around eight times over. Although one short-term goal is to put an end to domestic shortages, the ultimate aspiration is to sell excess electricity to Afghanistan and Pakistan, where demand for power outstrips supply. For that to happen, there will need to be progress in a similarly ambitious enterprise called CASA-1000 – an energy transmission network to join hydroelectricity exporters Kyrgyzstan and Tajikistan to South Asia. There is encouraging news on that front. In late October, officials with the government-owned national power utility Da Afghanistan Breshna Sherkat reportedly announced that work on the 562-kilometer Afghan section of the grid was due to start within two months. According to current projections, work on completing CASA-1000 is due to wrap up in 2020. A parallel scenario would see a lot of Roghun’s electricity soaked up by aluminum company TALCO, which announced in November 2017 that it plans to build a new $1.6 billion smelter together with China’s Yunnan Company. While this enterprise would, as the company insists, generate hundreds of jobs, it is less certain what it would mean for state coffers. A combination of preferential electricity tariffs and TALCO’s complex tax avoidance efforts means the company – which is understood to be controlled by close relatives of Rahmon – often constitutes a financial burden rather than a boon. In the Bobokhonov household, there is not a trace of skepticism that Roghun will be a project that benefits the nation as a whole – and them personally. Roghunshoh’s late grandfather hoped the boy’s fortunes would be buoyed by that of the dam. “He dreamed that Roghunshoh would become an electricity technician and that he would one day run Roghun. We will work so that he can fulfill his grandfather’s dreams,” said Bobokhonova.